Our next Bake! pick was chosen by Andrea, and she picked Ekmek, basic Turkish flat bread. This was made with NM's basic Middle Eastern flatbread dough (bread flour, salt, yeast, water, and olive oil). The dough was extremely wet and hard to handle, but once again proved to me the power of the stretch-and-fold. When it finished mixing, I had to basically pour it into the bowl. After twenty minutes, I scraped it onto a lightly-dusted counter and gave it a stretch-and-fold...instantly I could see and feel the dough strengthen. Although NM says not to let the dough rise for too long, there was no way I could make the bread in one day with the teaching-coaching-momming schedule, so I stuck the basic dough in the fridge. This afternoon, I pulled it out and continued with the rest of the Ekmek recipe: preshape the loaf, let it rest, stretch it into a long oval, dimple it, and bake. It worked out perfectly, even with the overnight rest. I served the bread with our favorite Indian-spiced chicken with tomato chutney, and I haven't seen a meal disappear off the table that quickly in a long time! As a sidenote: I was a little confused because the basic dough recipe says "makes enough for several flatbreads," but the ekmek recipe says "use one batch of basic dough, makes one loaf." I ended up using a full batch of the basic recipe to make a large ekmek loaf, and the pictures look just like the book, so I think that I made the right choice! 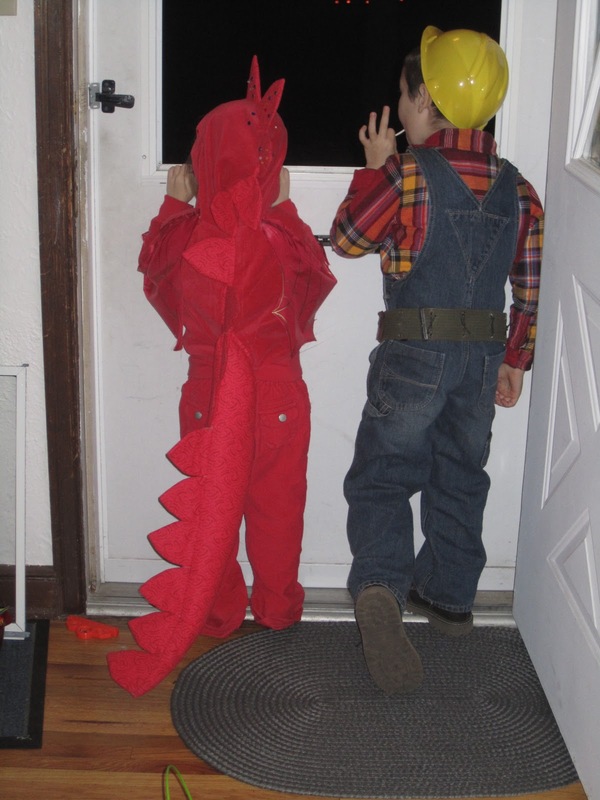 Happy Halloween from Smaug the Dragon and Bob the Builder! Hubby and I both had early morning meetings today, and nothing improves an early morning meeting like a shared breakfast treat! As I always do when I need a quick and yummy breakfast treat, I turned to Nick Malgieri. Like all of the scone recipes in the Modern Baker, these came together in about 20 minutes using the food processor: chocolate, cocoa, sugar, flour, baking powder, salt, butter, an egg, and some milk. They baked in 15 minutes and the first tray was off to hubby's meeting. 15 minutes later, the kids and I packed up the second batch and headed out the door. These chocolate scones were a huge hit, described by one coworker as chocolately without being too sweet. Hubby said, "They were a nice chocolate scone and then you got the burst of chocolate chunk which just made you say 'Ohhhh yeah!'" This was one of those clean-out-the-pantry recipes; I was short on a couple of ingredients, so I made a few changes. Our final October Mellow Baker bread is sunflower seed bread with paté fermentée; I made the paté fermentée first thing in the morning so it would be ready when I wanted to mix up the bread in the evening. For the soaker, JH calls for rye chops; I used the end of a bag of rye berries (chopped) and the end of a bag of cracked rye. Based on Joanna's comments that the four-hour soak didn't soften the rye chops enough, I used boiling water. This seemed to soften the rye perfectly. The rest of the dough was made with bread flour, water, salt, instant yeast, malt syrup, and sunflower seeds. My second clean-out-the-pantry was for the seeds: I toasted the end of a bag of sunflower seeds, the end of a bag of pumpkin seeds, and flax seeds. I made a third of the recipe, which made five large rolls. We really enjoyed them with butter; they reminded me of my favorite seeded dinner rolls at one of my favorite restaurants. A surprise win! 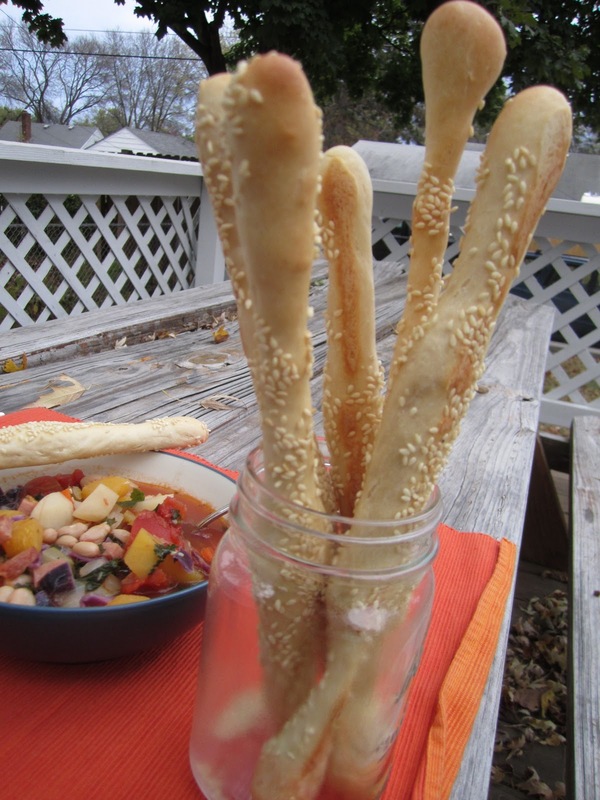 My second Mellow Bakers bread for October is a rarity in my bread baking books: the kids and I mixed up the dough for sesame bread sticks when we got home (about 3:00), and we ate the bread sticks for dinner at 5:30....talk about fast! The dough is made from bread flour, salt, instant yeast, water, olive oil, and malt syrup, mixed together in the stand mixer for about four minutes. It rises for an hour, and then is scaled into 24 pieces weighing about 3/8 ounce each. These rest for 15 minutes and then comes the fun part; Natashya commented that little kids would love to help roll the "snakes," and she was absolutely right. My kids were thrilled to roll the pieces into long snakes, which I lengthened a bit, rolled on a wet cloth, and then rolled through a plate of sesame seeds. They're baked immediately for 20 - 25 minutes (ours were a little fat, so took a little longer). These were a huge hit, and a perfect accompaniment to one of our new favorite soups. Next time, I'll probably skip the plain sesame seed topping. The kids made me scrape them off so they could eat the bread sticks plain, and the hubby and I preferred the "everything" version I made when I ran out of sesame seeds (sesame seeds, dried garlic, dried onion, and poppy seeds). I kept the sticks in a large zip baggie, and they were still good days later. And now the soup! 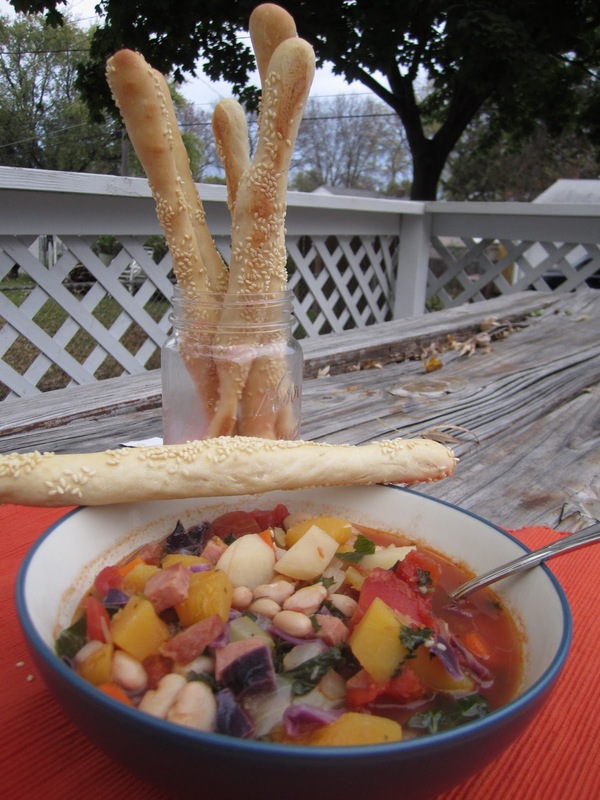 Several weeks ago, I was looking for a way to use up some leftover ham and a huge amount of CSA vegetables. I found this recipe, which I doctored based on what we needed to use up. Even if this soup wasn't delicious (which it is! ), I would seriously make it just for the gorgeous array of colors in the bowl! 1. Heat the oil in a large Dutch oven over medium-high heat. Add the ham and sauté for 3 minutes. 2. Add the onion and garlic and sauté for another 3 minutes. 3. Add the squash, potatoes, carrot, and spices, and cook for 4 minutes. 4. Add the tomatoes, and cook for 2 minutes. 5. Stir in the broth and bring soup to a boil. Simmer for 8 minutes. 6. Add greens, and simmer for 5 minutes. 7. Add beans, and cook for 4 minutes. My friend Di, host of the most excellent Virtual Cookie Exchange last winter and Sundae Sunday this past summer, decided that now that the weather is finally cooling off, it's time to bake bread! Her autumn event is dedicated to handmade loaves. My first Mellow Bakers bread for October is Berne Brot, a Swiss challah-like braided bread. Unlike challah, Berne Brot uses butter and milk. This is a quick one-day bread; I started mixing the ingredients when I got home from work and baked the bread before bed. I couldn't decide on the type of braid to use, and almost went with a simple three or four strand braid. But as I was paging through the Bread chapter on braiding, I re-encountered the Winston Knot, a braid I had tried with challah...unsuccessfully. My biggest problem back then was that I didn't roll the strands long enough, so I ran out of dough before I was through. This time, I followed the wonderfully clear instructions Celia offers in her Winston Knot tutorial...and it worked! Hurrah! I made a half recipe, which made about 840 grams of dough; six balls of 140 g, rolled out to about 60 - 65 cm (24" or 25"). I tried to err on the side of too-long, so that I wouldn't run out like last time. My dough was a lot softer than challah; in his braiding section, JH suggests dusting the braid strands with the tiniest, lightest dusting of flour to help prevent softer dough strands from baking into each other; it seemed to work. The taste was similar to challah or a less-buttery brioche, so as we always do with both of those, we made French toast. 1. Stir together the flour, vital wheat gluten, and salt in a large mixing bowl. Whisk the yeast into the warmed milk, and then stir the milk, eggs, and butter into the dry ingredients. Stir (I used my dough whisk) until it all comes together in a large, shaggy mass. 2. Knead in a stand mixer or by hand for 3 or 4 minutes, until the dough has developed. 3. Place dough in a lightly oiled bowl, cover with plastic wrap, and let rise for an hour. Stretch and fold the dough, recover the bowl, and let rise for another hour. 4. Split the dough into equal-sized balls, cover with plastic wrap, and let rest for 15 minutes. Then roll each ball into a long strand and proceed with braiding. If you're interested in trying the winston knot, I strongly recommend checking out Celia's tutorial. 6. Thoroughly brush the loaf with an egg wash.
7. Bake at 375º for 35 minutes, or until the internal temperature reaches 200º. Head over to Di's blog later this week to see the handmade loaf round-up! Wordless Wednesday: CSA squash, anyone? I actually picked this recipe because my dad loves pizza, but prefers thin-crust, and since none of my trusty pizza crust recipes are for thin-crust, I've never been able to share homemade pizza with him. But then we ended up having a bunch of people over for dinner, and we ate it all up! No fear, though: this recipe is super easy and super tasty, and I guarantee we'll make it again. This morning, I made the dough, which only consisted of whisking flour with salt, yeast with water and oil, and then mixing the two together. The dough rises for an hour or until doubled (mine took a little longer), is folded over a few times to smooth it out, and divided. I divided mine into three 364 g portions (to fit on my 10x15 baking pans), floured the pieces, wrapped them in plastic, and stuck them in the fridge. When we got home from our afternoon adventures, I pulled two pieces of dough out of the fridge, oiled two pans, and used my fingers to spread the dough out as much as possible. I used NM's simple tomato sauce, and then topped the pizzas with a sprinkling of olives, pepperoni, mushrooms and onions. I ended with grated mozzarella and asiago. The pizzas baked for 9 minutes. Seriously, so quick and easy! A perfect meal for having friends over: both the crust and the sauce can be made ahead of time and the assembly was much easier than doing our usual individual pizzas. The pizza got rave reviews from everyone. The crust was crispy and had great flavor. Check out Margaret's post for her beautiful margherita pizza! Happily, right after we got our first pumpkins in our CSA box, I got an invite from Phyl to participate in a virtual pumpkin dinner. There wasn't a lot of debate about what to make; the second my kids saw the pumpkins, they both yelled, "Pumpkin muffins!!!" We have a favorite family recipe, based on a recipe that one of hubby's oldest friends gave us when we got married. This is the first time I've used fresh pumpkin, though. I took two pumpkin-like squashes (our CSA grows many heirloom varieties, so I'm not always exactly sure which kinds we've gotten), cut them in half, and roasted them on a foil-covered pan in a 350º oven for about an hour. The skins slid off easily after roasting. Then I processed them in my food processor until they were smooth. I had a cup of puree to use for our muffins, plus another three cups to freeze for future pumpkin adventures. The next morning, the kids and I got to work! 2. Whisk 1 c (130 g) of the flour with the brown sugar, baking powder, cinnamon, baking soda, nutmeg, and cloves in a large mixing bowl. 3. Add the pumpkin puree, milk, eggs, and butter. Beat on low until blended. 4. Beat on medium speed for 2 minutes. 5. Add the other 1 c (130 g) of flour and mix on low until blended. 6. Spoon into greased (or papered!) muffin cups. 7. Bake regular muffins for 25 minutes, mini muffins for 16 minutes, or until a toothpick inserted in the middle comes out with just a few crumbs attached. 8. Cool in the pan for 5 minutes and then move muffins to a cooling rack. 1. Process the butter, cream cheese, sour cream, and vanilla in a food processor until combined, about 30 seconds. 2. Add the confectioner's sugar and process until smooth, about 10 more seconds. Right after I went on my baking/dessert hiatus, I stumbled on David Leibovitz's post for pumpkin ice cream. Each week when we picked up our squash-overwhelmed CSA box, I would click back over to the recipe and drool. I'm normally a chocolate-chocolate-chocolate girl, but for some reason, I have been obsessed by the idea of ice cream that tastes like pumpkin pie. And today was the day! Today was our annual orchard/pumpkin festival trip with some good friends and their little ones, and we decided to come back to our house after the festival for dinner. I needed a dessert, and what better treat after a pumpkin festival than pumpkin ice cream? 1. Whisk the softened cream cheese with the salt in a large bowl. 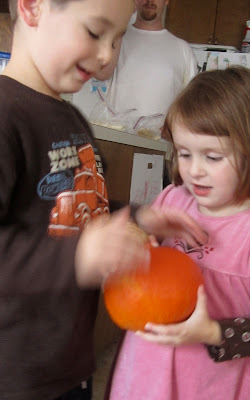 Then whisk in the pumpkin puree and honey. Set aside. 2. Combine half-and-half, brown sugar, corn syrup, and spices in a large sauce pan. (Use a 4 qt saucepan. I tried a smaller one and it boiled over!) Bring to a roiling boil over medium-high heat and boil for 4 minutes. 3. Whisk two tablespoons of milk with cornstarch. 4. After the milk mixture has boiled for four minutes, turn off the heat and gradually whisk in the cornstarch slurry. Bring the mixture back to a boil for one minute, stirring with a heat-proof spatula. 5. Pour the milk mixture into the bowl with the cream cheese/pumpkin mixture, whisking until smooth. 8. Freeze in your ice cream maker according to the manufacturer's instructions. Freeze in a container for four hours. I decided that we needed a little cookie treat to go with the ice cream, and Phyl's Bake! pick of ox tongues seemed like the right choice. So I took a small piece of puff pastry from the freezer (about 200 g), rolled it out in some sugar, used a small round cutter to cut out small circles, rolled them into ovals, chilled them, and baked them for about 15 minutes until the sugar had caramelized. This ice cream was a huge hit! In fact, the entire quart disappeared in one night, and one of our friends' little ones kept saying, "More? More?" after the container was empty. It tasted just like pumpkin pie filling, only in ice cream form. The ox tongues were perfect; a little piece of sugary buttery goodness to round out dessert. Twitter avatar fun: Mark Bittman's pancakes! Nancy came up with the brilliant idea for us to choose a new chef each month, bake recipes from that chef, and use a picture of one of those recipes for our Twitter avatar. It took me forever to settle on a chef for my month (October). Finally, looking through my cookbooks, I decided on Mark Bittman. I'd won his How to Cook Everything in a silent auction last July, and I wanted an excuse to start using it. Suddenly it's my month, and I realized that in the past almost-year since I selected him, I've begun cooking from Mark Bittman a lot. I use his How to Cook Everything for reference all of the time. He offers so many basics with so many fun variations that you feel like you're creating your own recipe. His book was especially helpful this summer, as I tried to figure out what to do with all of our CSA veggies. Also, Mark Bittman has started writing a Less Meat, More Flavor column for Cooking Light, one of my essential cooking magazines, and we've tried a bunch of those recipes this year. And I've started following him on Twitter, so I now get links to his NYT recipes and articles. Today, on the way home from preschool, I suggested pancakes for dinner. My kids (who always request pancakes when given the dinner choice) were ecstatic. Suddenly, my little guy said, "What about banana pancakes with chocolate chips?" (Where do they come up with these things?) Usually, we eat buttermilk pancakes with blueberries (using ATK's recipe). So I said, "Sure, I could give that a try." When we got home, I turned to my trusty HTCE, and sure enough, he had a recipe for incorporating bananas into pancakes! These were less fluffy than our usual buttermilk pancakes, but they were really yummy. The regular pancakes had just a hint of banana flavor, and with the addition of the chocolate chips, they were a huge hit and a definite repeat. Even hubby ate his without syrup! 1. Whisk the dry ingredients together in a large bowl. 2. Combine the melted butter, eggs, and milk. Mash the banana and add it to the liquid ingredients. 3. Whisk the wet ingredients into the dry, being sure not to whisk too much (you want some lumps in the batter). 4. Pour batter (in 1/4 cup increments) onto a hot griddle (we use an electric griddle, although you could cook them on the stovetop on a griddle with butter). Sprinkle some mini chips on the pancakes and cook until bubbles form on the top and the bottoms are golden. Flip and continue to cook until the other side is also golden. According to Mark Bittman, the batter can be made a day or two ahead of time and stored in the fridge until ready to use. Kayte's pick for our next Bake! recipe happened during my September baking hiatus. But with the weekend bringing a new month and a trip to the apple orchard, I knew that it was time to make......apple lattice tarts! I had four mini tart doughs stored in the freezer, so I used those, even though they were cookie dough crusts instead of the flaky dough crusts that were called for. I figured they'd work just as well, and I was right. The dough was enough for three mini tarts and the lattice topping. This may have been the easiest apple pie-type filling recipe that I've ever encountered. I simply peeled, cored, and chopped the apples, and then tossed them with a sugar, flour, and cinnamon mixture. Finally butter is dotted over the filling and strips of dough are placed on top to create a lattice. Easy-peasy. I made a third of the topping, which was enough for my three minis, plus a little ramekin of extra filling. They baked for about 35 minutes, and were absolutely delightful. Happy October! I'm so happy that it's October and my kitchen finally looks like my kitchen again: dishes in the dish drain piled to the ceiling, all attachments for my stand mixer hanging out, multiple baking sheets and cooling racks perched on corners of the counter. I gave up baking for the month of September. This summer was good for our tummies, but not so much for our waistlines. Having kids old enough to play more independently combined with being two teachers on summer vacation meant that I had a lot of time to play in the kitchen and, with no one going to work, daycare, or preschool, all of the treats just sat on our counter and we ate them all. Tasty, but not good for us. So, since September is a busy month anyway with the start of school, debate, and preschool, I vowed to clean it up: no baking (with the exception of two tiny loaves that I made for Mellow Bakers and made hubby eat), no pasta, no bread, no desserts, no ice cream. It was a long month. :) Just kidding. Actually it felt pretty good, and it wasn't until last week that hubby started asking plaintively, "How long until October?!?" For the Artisan Bread Bakers' Bread of the Month for October, my friend Phyl chose pumpkin knotted dinner rolls. Kayte made them first, and since she hates pumpkins and absolutely raved about them, you know I had to try them. This was an easy recipe, made by combining yeast (I used instant), warm milk, melted unsalted butter, eggs, sugar, salt, and flour (I used a combination of all-purpose, bread, and white whole wheat)...and the secret ingredient: pumpkin! I had an extra cup of pumpkin puree in the freezer, leftover from the pumpkin muffins that I made for next weekend's pumpkin roundup (stay tuned!). After kneading, I let the dough rise for about an hour and a half, with a stretch-and-fold in the middle. Then I divided the dough in two, put half in the fridge for later in the week, and split the remaining half into 60g sections. These I rolled and knotted. They rose for another hour or so and then baked for 15 minutes. These rolls are light and fluffy, with no hint of pumpkin flavor, but a beautiful orange color. Try 'em!